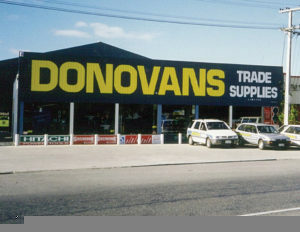 Donovans Trade Supplies is a locally owned Whangarei business operating continuously since 1946. Following three previous owners, Warren Parr bought Donovan Trade Supplies in 2005 after having worked for the company for eight years. He continues to operate the business, hands-on, out on the floor, with 17 loyal staff, some of whom have been with him for over 13 years. Donovans Trade supplies carries the largest range of engineering tools in Northland, has expanded into welding, and offers the best in generators, plus a wide range of fasteners, adhesives, and much more. Donovan Group was originally owned by the Donovan family who supplied electrical rewinding equipment post-war. The business expanded its range of products as power tools became popular. Eventually the tools side of the business grew such that the company was split in two and Donovan Trade Supplies came into existence. 63 years of local business, is a business you can trust, with service like they had in the old days. Deal direct with Warren, or choose a category specialist on site.